Working with leading screed manufacturers, we have become one of the Country’s leading floor screed installers. We are aware that modern construction programmes have place a demand on products to be fit for purpose. Therefore our policy to embrace innovation and develop our business model, to continually deal with installation of new products, ensures we can provide our Client with the best product to suit their requirements. Ideal for sub-floor levelling screeds with the capability to install up to 2000m2, in one day. This screed is suitable for most applications, including hospitals, shopping centres, hotels, schools and apartments. Can be used with thermal and acoustic insulation and is ideal for use with under floor heating systems. Less tendency to crack and does not curl. The need for construction joints is greatly reduced with no requirement for reinforcement. Floors can generally take foot traffic 24-28 hours after installation. Traditional screeds used as a levelling screed to concrete or insitu pre-cast concrete suspended slab. A hand applied, semi dry system, it can be laid to falls. Can be supplied in a ready-mix form or site mixed using a forced action mixer. In either form, it can be pumped into position if access is a problem or if it is required on upper levels. If thermal or acoustic properties are required, suitably reinforced sand and cement screeds can be laid over most types of rigid insulation or thin sound deadening quilts. The award-winning Isocrete K-Screed range from Flowcrete UK is best known across the construction industry for its ability to deliver the ‘level best in floor screeds’ by combining high strength with rapid installation and excellent moisture control. Containing the innovative K-additive, a plasticising and accelerating admixture used to modify and enhance the performance of sand/cement based screeds; Isocrete K-Screed delivers a strong and level platform on which to install a host of floor finishes and coverings. 10 year guarantee from Isocrete. Isocrete Standard K and Heavy Duty K screeds can be bonded, unbonded or floating (for weight saving and thermal or sound insulation) and may be used with proprietary under floor heating systems. 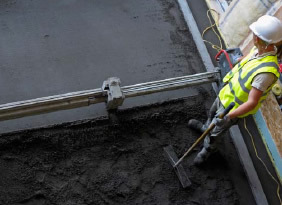 Can be used in high traffic areas such as airports, shopping centres and hospitals where a high strength (category A) screed is required, especially where thin finishes ie vinyl, carpet, wood or resins are to be used. Higher compressive strength, thinner application and quicker drying. Isocrete M Bond & M Bond Extra.